Kratos and Atreus make for the mountain summit to find the path to a new realm. Chapter 11 of our God of War walkthrough focuses on the mission titled Return to the Summit. 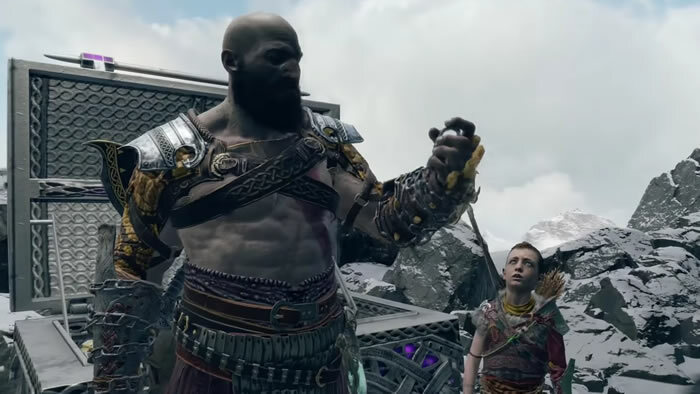 Within it, Kratos and his son Atreus must head east up the mountain path and reach the summit, but not without dealing with a few chance encounters along the way. Head down the path toward the doors, then walk through. Approach the runes in the back of the room to have Atreus read their contents. After that, follow the path through the rubble to the southwest, jump down the short cliff, and climb up the boards to reach the cliff ledge. Shimmy across, then head through the doors to go outside. Watch the cutscene with Sindri, then make use of his services if needed. Turn and head south for an encounter with two powerful beasts. Once they've met their ends, follow the southern path up and then left to reach the climbable wall. At the peak, continue east under the tree and through the cave. Clear out the draugr and continue climbing the eastward path up the cliff and into the courtyard. Two portals will open and flood the area with enemies. Take them out with the usual methods, open the chest by the entrance, then climb the ramp and go through the double doors. On the other side, clear the brambles to the right, then once again continue east up the winding staircase. Jump across the gap, climb the rock wall up, then turn north and enter the doors. 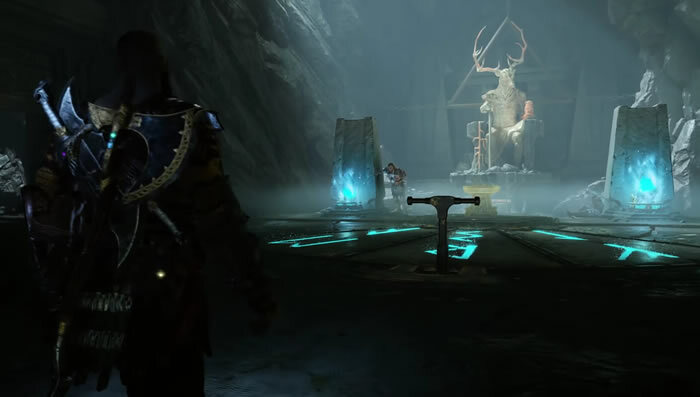 Within the chamber, watch the cutscene with Atreus, Modi, and Kratos unfold. After it's done, head through the doorway to the north and follow the path past the roots then up the rock wall on the east side. Jump down to the cliff, clear out the enemies, then continue east through the door. Kratos and Atreus will come into a large clearing. Take out the enemies, grab any items or loot left in the area, then follow the objective marker to the lift and ride it up. Listen to the conversation between Kratos and Atreus. When the lift has reached its destination, Kratos will get flanked by a number of enemies. Put them to the blade, grab all the loot, then continue east down the path to locate a scroll on the floor. Climb underneath the cliff, then jump up over the ledge and head into the chamber to encounter a Frost Ancient. Kill it, then head to the south end of the room and across the ledge. Burn the brier, then open the chest for some rare loot. Turn back west toward the objective and go through the doors to arrive back outside at The Summit. Interact with the Realm Tear if desired, then open the treasure chest for a Niflheim Cipher Piece. Clear the briers on the south wall, then climb upward twice to reach the snowy path. Follow it to the gate, then clear the brier and climb up the wall. Have Atreus reveal the rune, then use the chisel to break it apart. The bridge to Jotunheim will appear, but before it can be crossed, Baldur will drop in and attack. Enjoy the cutscene, making sure to provide input where needed. 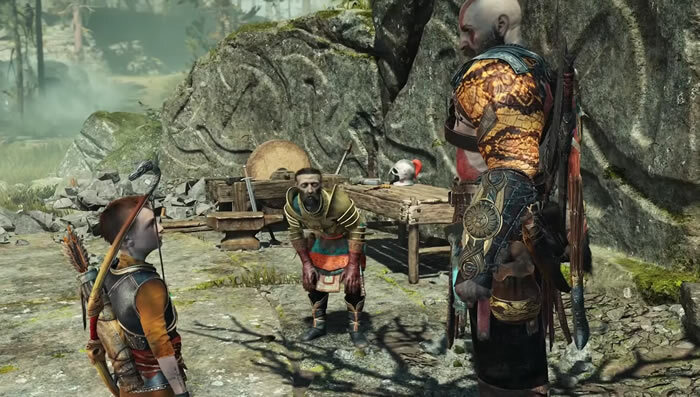 This scene marks the end of Kratos' Return to the Summit. Next up is the quest titled Escape From Helheim. Be sure to check out our God of War walkthrough and guide for more tips, strategies, collectible locations and more.